If you’re not drooling from the title of this recipe it might be because your brain is trying to figure out how this all works together. It’s actually an incredibly balanced meal, with just the right amount of sweetness, light and cool, and spicy. It combines for a light, but filling dish. It’s definitely not your typical taco, but it’s one you’ll remember and enjoy as being incredibly satisfying. In a large pan, heat the olive oil. Add in the garlic and jalapeno and saute until the garlic becomes fragrant and the jalapeno begins to cook through. Add in the chunks of pork and saute over high heat. Add in the fish sauce and stir for a couple minutes until the pork is cooked through. Add 1 tablespoon water and 1 tablespoon sugar. Stir in with the pork. About a minute later, repeat. By this point the pork should be caramelized. If not, add another tablespoon each of water and sugar, and stir. Meanwhile, prepare the salsa by combining the cucumber, pineapple, cilantro, green onion, lime juice, and salt and pepper in a mixing bowl. Lightly toss. Mix the mayo and sriracha together in a separate small bowl. 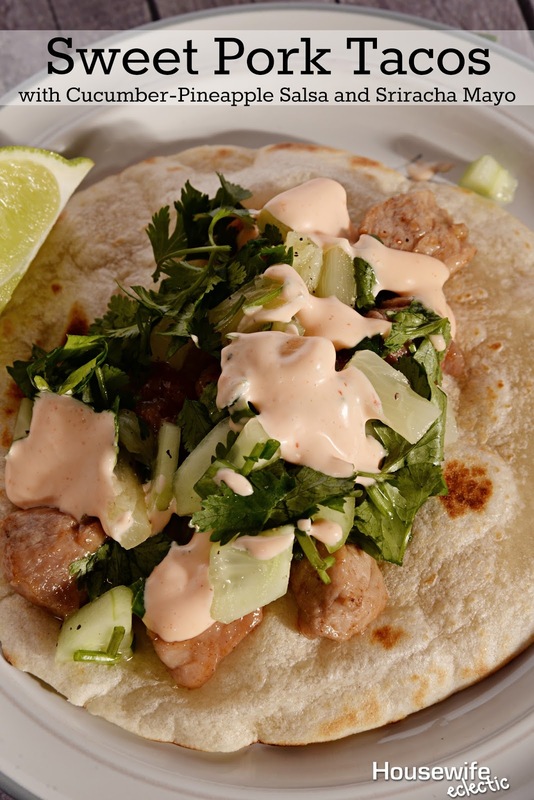 Prepare the tacos by placing the pork down the middle of a warm flour tortilla. Top with salsa, sriracha mayo, cilantro and a hit of fresh lime. This dish blew my family away. We had my parents over for dinner and they were suspicious. After all, fish sauce smells terrible (but packs a ton of delicious flavor). But they were amazed by this dish. The pork is sweet and flavorful. The salsa is unlike anything you’ve ever tasted. It probably would be bland with chips, but complements the meat well. And the sriracha mayo adds just that extra hint of heat to balance the sweetness of the meat and pineapple. It’s a dish that’s more related to Thai food than Mexican, but it’s super tasty no matter what it is. That salsa sounds so good. I bet my whole family would love this meal! I love the whole idea of tacos! I just started transitioning to vegan and this would be super easy to re-work with 2-3 substitutions:) That salsa sounds yummy and the mayo is super easy! No I just need some veganaise! This looks FUN! I love cooking outside of the box and the spicy with "cool"? Sign me up! MMM Pork Tacos. I bet they taste amazing. It seems like anything pork and pineapple is to die for! You have me at sriracha mayo. We have a lot of tacos in my house so I need to add this to the rotation. All those ingredients together sound amazing! I like pretty much anything that includes pineapple. Taco recipes seems to be all over this week! I never even thought about using pork in tacos. Great idea and everyone here likes pork. Yum! I have never thought to use pork in tacos before, but that would be a great swap for the beef! yum, these look fantastic. We have tacos all the time but it's never pork. Must try them. That's a really unusual combo. Never would have thought to put pineapple on there. I love it on my pizza so might give this a shot. I might make that salsa just to eat as a snack! It sounds delicious. Actually, the whole dish sounds good to me. I am going to have to see about making it in the coming weeks! No tacos for me! I'm on a diet haha looks delish. Looks so good! Too bad my diet won't allow me! I wish LOL! That salsa got me… or maybe the sriracha mayo! Yum, pinned to make over the weekend! thanks! These look incredibly tasty. I love Mexican but usually have chicken, will have to try this. The sauce looks insane!!! I just made some sriracha mayo the other day and have quite a bit leftover. This would be the perfect recipe to use it on! Thanks for linking up with Delicious Dishes Link Party! Mmmmm! So glad you shared this recipe with us at Merry Monday. Your salsa sounds especially scrumptious!